Motorola SBV5100: The New Standard in Cable Modems? Motorola annnounced the newest addition to their cable modem family, the Motorola SBV5100. 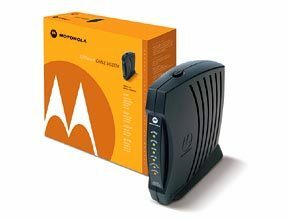 The Motorola SBV5100 and the next generation of Motorola cable modems will be based on SIP, the most widely used VoIP protocol. The Motorola SBV5100 supports full-featured primary Voice-over-IP (VoIP) telephone service for up to two telephone lines that are terminated in two RJ-11 connectors. In addition, its integrated cable modem connects to a computer through either a 10/100Base-T Ethernet or a USB data port. The Motorola SBV5100 will be available later this year. What interests me the most about this product is the movement by hardware manufacturers towards VoIP as a standard feature in home networking products. Numerous companies have added RJ11 FXS ports to their SOHO routers, but now it looks like the focus will be on enabling the SOHO modem for VoIP. I am sure Linksys, D-LInk, Zoom, and Westell will soon follow with their own VoIP enabled cable modems.